There are two types of leveling in Skyrim: character leveling and skill leveling. Each time your character level increases, you are provided the opportunity to make key choices about your abilities. This means you may choose to increase either Health, Magicka or Stamina by 10 points, and you are also given one new perk point to invest in one of 18 different skills (listed below). Each time you increase any skill's level, you make progress towards gaining a character level. This increases the general effectiveness of that skill, while a minimum skill level is required for most perks to become obtainable. Leveling your character is not the same as it was in Oblivion - instead, it is based on an experience system related to skills. As you use a skill, you automatically gain a small amount of experience in that skill (which we will call "Skill XP"), eventually causing that skill to level up. Skill level-ups can also be acquired instantly from training or by reading skill books. Every time you level up a skill, you also gain experience toward a character level-up (which we will call "Character XP", or simply "XP"). Furthermore, increasing the levels of your skills is the only way you are able to increase your character XP. However, leveling up low-level skills offers only a low amount of character XP toward your next level, while leveling up high-level skills offers more. The required amount of character XP needed to gain a character level-up increases as your character level increases. Unlike in Morrowind and Oblivion, attribute bonuses gained at level-up have been simplified, eliminating the need to "budget" one's skillups in effort to achieve maximum attribute increase. Most content is still leveled (primarily enemy gear), and some players may choose their perks and attribute increases unwisely, so it is still possible to create a character too weak to keep up. However, if you have installed the Dragonborn add-on, you can expend dragon souls to reset perks. See the Leveling Decisions section below for details. The amount of skill XP you receive from using a skill in a specific way is constant. However, as you increase in skill level, the amount of skill XP required for the next skill level up increases. This is why blocking a few attacks from an ice wolf may level up your Block skill at the beginning of the game when your skill level is low, but when your Block skill is higher later in the game, it will take a lot more attacks to level it up. In this instance, your Block skill would level up faster if you blocked an attack from a giant. Keep in mind that some skills are much easier to level up than others. For instance, you may quickly level the Smithing skill to 100 by crafting nothing but jewelry; it will take a very long time, however, to level One-handed to 100 solely by attacking skeevers with a specific one-handed weapon. Further, successfully using your skill yields more skill XP than unsuccessfully using it. For example, successfully picking a lock gives you more Lockpicking XP than does breaking your lockpick in the attempt. Sneak will only increase if you are within range of and are avoiding detection by an entity that would otherwise be aware of your presence, or escaping from one that has detected you. You do not need to move for the skill to increase, though completing actions that are more difficult will increase the skill faster, such as moving and, more notably, completing sneak attacks. Conjuration derived from Raise Zombie or similar spells will only increase if the minion engages in combat, while Conjuring Bound weapons only garners skill XP if you are in combat. Restoration will only increase if it is replenishing lost life (with a few exceptions) and will level up faster when in combat. Alteration derived from Detect Life will only increase if you are actually detecting life forms with the spell. The more life forms you detect, the faster your skill will go up. Destruction from runes will only increase if the runes are triggered. Other Destruction spells require a valid target, either a creature or an NPC. Pickpocketing increases proportionally to the total value of lifted goods, assuming you are not caught. Lockpicking will gain a small increase for every broken pick, and a substantial increase that varies based on lock level versus skill and perk level for every successfully-picked lock. However, if you successfully pick a lock that you have picked before, there is no XP reward. Smithing, Alchemy, and Enchanting give skill increases based on the results of the crafting. Note: Over-training will still grant you level ups even if the progress bar is stuck at 100% (for example: If you start training Illusion from level 1 to Illusion level 44 you will be level 6 once you choose to level up). Level XP is the experience points put towards raising your character's level. Skill XP is the experience points put towards raising your level in a particular skill. Where the default values for Skyrim vanilla (1.9.32.X) are fXPLevelUpBase = 75 and fXPLevelUpMult = 25. This results in: 45*(50)+10=2260 XP. So, sticking with our example of Lockpicking, you would need to break 86 picks to level Lockpicking from 15 to 20: 1815.5444244802648/(45*(.25)+10) = 85 and change, meaning you'd need the 86th pick broken to level up. For comparison, you would need to successfully pick 19, 13, 8, 5, and 4 locks of each lock difficulty to do the same thing. In addition to different skills using different values for both calculating experience needed per level and experience gained per use relative to some base, different skills work differently in terms of how leveling up the skill also speeds up the base. For example, all three crafting skills let you make more expensive things as you level, and gain more experience from more expensive things; by contrast, Speech always uses the base value of an item, so using better speech to sell an item for more money does not gain you more experience. 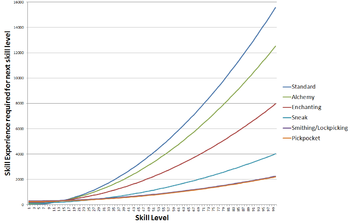 Graph of the Skill XP required to level the Skill to the next level as function of the current Skill level. Formula followed: Skill Improve Multi * Current Skill Level1.95 + Skill Improve Offset. The standard skills include: Archery (Marksman), One-Handed, Alteration, Block, Conjuration, Destruction, Heavy Armor, Illusion, Light Armor, Restoration, Speechcraft and Two-Handed. Graph of the total Skill XP accumulated for the current level of the skill as function of the current Skill level. The standard skills include: Archery (Marksman), One-Handed, Alteration, Block, Conjuration, Destruction, Heavy Armor, Illusion, Light Armor, Restoration, Speechcraft and Two-Handed. Base Magicka Cost of the Spell. 1 base XP damage healed by healing spells. 1 base XP per Magicka used on non-healing spells. 1 base XP per item enchanted. 1 base XP per 400 enchantment gold value of items disenchanted. 0.05(Petty), 0.1(Lesser), 0.2(Common), 0.4(Greater), or 0.6(Grand) base XP for recharging a weapon. 1 base XP per raw damage blocked. 5 base XP for a shield bash. 25 + (3 * item value0.65) base XP for constructing an item. 25 + (8 * item value delta0.6) base XP for improving an item. Note that in the original Skyrim.esm the skill use multiplier is 160. 1 base XP per raw damage received. 1 base XP per gold value stolen. 0.25 base XP for a broken pick. 2, 3, 5, 8, or 13 base XP for successfully picking a lock. 2.5 base XP for becoming hidden within ~45 feet. 0.625 base XP per second hidden within ~45 feet. 30 base XP for a melee sneak attack. 2.5 base XP for a ranged sneak attack. 1 base XP per gold value created. 1 additional base XP for each successfully created potion. 1 base XP per gold used in transactions. 75 * Speech level base XP for passing Speech checks. † Destruction XP gain is reduced at difficulty settings higher than Adept, but not increased at lower ones. "Base Magicka" refers to the base cost of the spell. "Raw damage" refers to the damage before armor is taken into account. You are notified when you are eligible to level up. When you accept the new level—which updates to the highest level you have currently earned—your character is fully healed, regaining any Health, Magicka, and Stamina that was depleted. You can choose whether to do this immediately, or whether to use the level-up strategically to take maximum advantage of the healing bonuses. In addition, in the standard game, you can level up anywhere; unlike in Oblivion or Morrowind, sleeping is not necessary. However, with Survival Mode enabled, sleep is once more required. Note that when you do choose to level, you will be raised to the highest level earned through skill progression; so if you have progressed four levels since you last chose to level up, you will gain all four of those levels the next time you open the skills tab. It is possible, though quite tricky to raise one level at a time when you have more levels "banked". Immediately (as in almost simultaneously), once you confirm your level up attribute bonus, you need to press the exit button (B on Xbox, O on PS). It may take a few tries each time you try it as the window of opportunity is very very small. However, you won't be able to add any perks until you have cleared all "banked" levels. One attribute (Health, Magicka, Stamina) can be increased by 10 points. This choice is prompted for upon going to the perk and skill screen and leveling; if you gained 4 levels you will be prompted to make 4 choices in succession. One perk point will be awarded per character level gained. Perk points do NOT need to be used when leveling and may be saved for a later time. This allows you to either utilize perk choices for immediate benefit in skills for which you meet the minimum requirements, or to upgrade other paths once those requirements are met. It should be emphasized that the attribute choice is permanent barring use of the developer console on the PC version of the game. Perks can be reset by reaching 100 in the appropriate skill and making it legendary. Since skill advancement contributes to the earning of perks as general choices, it is possible to utilize a gain in unrelated skills to progress through other perk paths should that be desirable. With the Dragonborn expansion installed, it is possible to reset your perks after you have completed the main Dragonborn questline. Doing so will consume one dragon soul, and will allow you to clear all perks from one skill tree, refunding the perk points back to you. This process can be repeated as many times as desired, provided you have the dragon souls. Enter the skill screen by pressing Tab and selecting "Skills" (2x Up-Arrow or W-key), or alternately by hitting the ?/-key. Once on the screen, you can navigate through skills either by using the movement keys (A, D, W, S) or clicking with your mouse. Make sure the skill to which you would like to add a perk is centered on the screen and the constellation is visible. This brings up the perk tree for that skill. Navigate to the perk you wish to add. To add the perk, click directly on the star below the text. This will bring up a pop-up screen that you can answer with "Yes" (Enter) to add the perk or "No" (Tab) to cancel. At higher levels, leveling up happens much more slowly. Level increases in Skyrim follow a formula (detailed above in the Gaining Levels section). Prior to Patch 1.9 the maximum level was 81, since there was no way to gain any more experience once every skill reached its maximum value of 100. With Patch 1.9, individual skills can be made "legendary", denoting them with an Imperial symbol. This will reset the skill to 15, and perk points used for that skill may be redistributed. Gaining levels in that skill will affect leveling again, thus effectively removing the level cap of 81. There is no restriction on the number of times that skills can be made legendary. This change makes it theoretically possible to obtain every single perk in the game. You can level up even after reaching level 252, so you can continue to increase magicka, health or stamina, though you will have nothing left to spend the resulting perk points on. According to the formula, training one individual skill all the way from 15 to 100 (one mastering cycle) yields 4,930 XP. This amount of XP is enough to level from 1 to 17, or from 194 to 195. Leveling up to 252 (unlocking all perks) would take a total of 809,475 XP. This corresponds to over 164 skill mastering cycles, or mastering every skill over 9 times. The fastest approach to such a huge task would be to find the easiest skill to raise and to exclusively focus on that for leveling purposes, though Keep in mind, that to actually spend all 252 perk points every skill needs to be 100. Various aspects of the game are leveled. This means that as your character increases in level, some enemies become more challenging, but also the quality of the items you find becomes better. However, the leveling system in Skyrim has been altered from that used in Oblivion, in response to criticisms of Oblivion's leveling system. Different locations in Skyrim have different inherent difficulties. In other words, some dungeons are designed to be too difficult for low-level characters to enter. More challenging dungeons are generally located at higher elevations, meaning that early in the game, players may want to avoid mountainous regions. However, more difficult dungeons contain better rewards. In addition, some high-quality items can be randomly found even early in the game. In addition, all leveled enemies are generated more like leveled creatures in Fallout. For example, Bandit NPCs are always a fixed level for their name (Bandits are level 1, Bandit Thugs are level 9, Bandit Highwaymen are level 14, etc). The player's level affects the range of possible bandit types generated within a bandit dungeon, and probably the frequency, but does not seem to affect the resulting stats except in a few rare cases. Lower variant bandits remain reasonably common even when more dangerous bandits are available. Enemy types also seem to reach a plateau where they stop getting stronger. The strongest bandits (non-boss) are mid-20s. The strongest generic vampire is 54, and guards seem to stop scaling at 50. This implies that the difficulty of many areas will not increase beyond certain levels, except perhaps in frequency of difficult encounters. In other words, dungeons have a level range, where if you do not meet the level requirement, you will face the lowest range of the dungeon. For instance, if a dungeon is ranged from level 15 to 25, and you are level 10, you will face creatures in the dungeon scaled at level 15. However, at the other end of the scale, most dungeons become relatively trivial after you've played the game for a while and have leveled up enough. The highest random leveled enemies in the original game are Ancient Dragons and Dragon Priests, but even these enemies were only meant to fight players around level 50. All NPCs tagged as Essential can be used as effective training dummies for combat skills. The best ones to use are those that will not report you for assault, such as Hadvar or Ralof during Unbound, or any of the Greybeards. However, even these examples may sometimes report you, though giving you zero bounty crimes that cannot be cleared, but causing problems with guards and crime-fighting citizens. Committing a crime with a bounty attached and paying it off should clear any zero bounty crimes. There are multiple opportunities to infinitely level some of your skills during the opening quest, but it is quite easy to break the game by over-leveling. The game-breaking comes because the enemies you face will be far too hard to kill, and can kill you very easily. If you decide to use one of these methods and have a high starting level make sure at least one of your combat skills is leveled appropriately so you can cope in the much more dangerous Skyrim you have created. It is also recommended that you focus your attribute bonuses on health in order to better survive while you find some suitable armor. None of the methods here are unique, but the opportunity at such an early stage is worthy of mention. The first opportunity to level is during your escape inside the burned-out tavern. In the corner facing the area where Alduin lands in front of Hadvar and Haming you can crouch and hide to level up your Sneak skill. This corner can be tricky to use as you will randomly be spotted by Alduin, and this method is rather slow. This is also the first and only way to level any skill before entering the keep. Once inside the keep and hands are untied you can use magic. Your range of spells is rather limited and at this point you can only use flames to level at a rate quicker than painfully slowly, but your companion will not move until you arm yourself with a weapon, so you can take as long as you want and burn him to level your Destruction. You can also wait until after the torture room where you can pick up some clothing with magic bonuses and attack your companion at every chance you get. The next opportunities depend on who you side with (see below). The last opportunity during the quest comes with the bear at the end of the escape tunnel. At this point you are given a bow and some arrows. You can shoot your companion with these and any other arrows you have collected to get some free levels in Archery, but you cannot recover the arrows in order to continually boost your levels. However, you can level your One-handed, Two-handed, Destruction, and Sneak (in conjunction with One-handed) infinitely by attacking your companion (Sneak is leveled by crouching and attacking with either a One-handed weapon or bow). As long as you don't attract the attention of the bear and subsequently kill it your companion will remain by the cart. A final chance comes with the bear. As long as you stay within range without it detecting you your skill will rise. The unique opportunity comes with the friendly Torturer, as long as he survives the fight in the room. You will need to use one of the iron daggers found here as the Torturer is not essential and can die, however he will not turn on you unless you make three quick attacks on him. Equip one of the daggers and then start sneak-attacking him with normal attacks (not power attacks). This levels up both Sneak and One-handed and can be done to level 100 at this point as long as you take no perks affecting damage by the dagger. You can start to level Pickpocketing here too. Find the few coins in the room and then reverse-pickpocket the coins onto the Torturer. Take the coins back and then place them in his inventory again, and repeat. While this can be done with any other item it is very difficult. You can easily gain a few levels but more than that will take a long time as experience is based on the value of the item(s) moved. The unique opportunity comes in the kitchen before the Torturer. You must kill the heavily armored Imperial soldier and loot the key from her body before Ralof gets it (you may wish to make a save before entering, in case he gets it). If you obtain the key Ralof will move to the locked door and wait for you to open it. Until you open it you are free to use him to train your Destruction, One-handed, and Sneak skills. Train using a skill trainer and then pickpocket your gold back. You can use the Unrelenting Force shout to knock down the trainer, and then pickpocket them while they are getting back up (even though the menu still displays 0% chance, you cannot fail). However, you should save your game first as sometimes (though not often) this method will cause NPCs to attack you. You can put a Paralysis poison in the NPC's inventory and then steal the gold, and they won't attack you. Keep in mind that only 5 skill points may be trained at a trainer per level across all skills. At higher levels, 5 skill increases will earn only a small portion of the experience needed to level. The remaining skill increases you need to level must still be earned normally. Thus, the spending of 7 perk points in Pickpocket to maximize this method has a fairly poor return when compared to doing a dungeon crawl or two (at higher levels) for the 25,000+ gold you need for 5 training points. However, if you are focused on getting Pickpocket to 100, this method will get you there every few levels, and then if you make Pickpocket legendary, you will get back the perk points and can start to retrain Pickpocket. You should be able to train Pickpocket to 51 using a skill trainer, while pickpocketing your gold back to increase Pickpocket even faster. Be warned that starting this process at lower levels can leave you in great difficulty in combat, if you have not trained any combat skills. There are several trainers who are also permanent followers. In this case, you can have them follow you, ask them to train, and then ask them to trade and take your gold back. Notably, there are 5 trainers (3 expert: Archery, Block, One-handed, 2 master: Heavy Armor, Two-handed) in the Companions headquarters (Jorrvaskr) in Whiterun who are eligible to become your follower after you complete the Companions quest line. Faendal in Riverwood may also be recruited as your follower if you complete his quest in his favor, and he is a common Archery trainer. There are many trainers who also sell merchandise - such as the College of Winterhold, for instance. Without the Merchant perk, trainer-merchants will only buy items of a similar type they sell. For instance, trainers at the College of Winterhold, will normally only buy or sell spells, clothing (not armor), jewellery, books, gems and staves. Once you have access to an enchanting table, it is fairly inexpensive to enchant jewelry with Waterbreathing for a good profit. Similarly, general merchants, armorers and fences will buy an iron dagger enchanted with Damage Stamina which sell for a good profit at low levels, whereas Banish enchanted items weapons sell for very high profit. Simply make several items like these, ask the trainer to train you as normal, and then ask what they have for sale and get your gold back by selling them the enchanted daggers. You may need to have the Merchant perk in Speech; most trainers will not normally buy weapons. At higher levels of skill training, this can also help you to train Speech. This exploit has been removed by version 1.9.26.0.8 of the Official Skyrim Patch. Activate an empty book shelf to access the book shelf menu. Find the Oghma Infinium in your inventory, and open it. Choose any path (The Path of Might to level Combat skills, The Path of Shadow to level Stealth skills, or The Path of Magic to level Magic skills). Store the Oghma Infinium on the bookshelf. Leave the book shelf menu. Activate the Oghma Infinium on the book shelf. Repeat the above until you are satisfied with the amount of levels you have gained. In the course of this quest, when you activate the focal points with the Tuning Gloves, you may be given a potent magicka recovery bonus (paradoxically from what should have been a Drain Magicka effect) for two hours that lets you cast and recover instantly. This can be used to cast expensive spells over and over to gain levels, if given the appropriate circumstances. For increasing Alteration, use Telekinesis to carry an object in front of you while you walk, or repeatedly cast Waterbreathing while standing in water at least knee-deep. Casting Detect Life in a crowded city will continuously level Alteration, limited in this circumstance only by your patience. For even quicker leveling in Alteration, use Telekinesis to carry an object (preferably one of low value such as a tankard or a plate), then fast travel while still holding it. The farther the distance traveled, the higher the skill will increase. The item will be dropped where you fast travel from. For increasing Illusion, Muffle is consistently great at all levels, while Harmony is better at higher levels, but in limited circumstances. For increasing Conjuration, enter combat with anything and repeatedly cast the highest cost Conjure weapon spell you can (doing this when detected by an enemy that cannot reach you allows you to choose when to stop the exploit, and a weapon is better than a creature as they will try to kill the enemy). You can also use Soul Trap spell on a dead body continuously to quickly advance in Conjuration. For grinding character levels after already maxing Conjuration at least once, resetting it to 15 and summoning any Thrall mid-combat earns a huge amount of experience, especially at low Conjuration levels. This requires a good set of enchanted gear to counter the high mana cost but can be used to gain character levels extremely quickly. For increasing Restoration, casting Equilibrium (to drain health) in one hand and any healing spell in your other hand will level it rapidly. Once obtained, repeatedly casting Circle of Protection is an even faster method. For increasing Destruction, just repeatedly blast away at people and creatures with your most magicka-expensive spell in that school. This can be combined with the Essential Combat exploit, as normal enemies will always eventually die. If you put an Alchemy boosting enchantment on a ring, necklace, gloves, and helmet, craft a Fortify Restoration potion, consume it, then unequip and re-equip the gear, this will cause the enchantments to temporarily be effectively better than they were, allowing you to create a stronger potion, which increases the effect even more. After repeating this a number of times, your potions can be boosted to a ridiculous level. If you craft a Fortify Enchanting potion which boosts your Enchanting skill by around 40,000% or more, you can enchant an item to boost alchemy by a ridiculous amount as well. This will allow you to craft potions that increase the skill considerably, even at level 15. This will allow you to boost alchemy from 15 to 100 in a matter of seconds, making it very easy to obtain additional levels. See the glitches page for a more detailed description. You can also use this to exploit the above exploit more easily. With a boosted enchantment skill you can make a single item with more than 100% reduction in spell cost instead of needing four, or add an obscene amount of fortify magicka (e.g. 1m points) so that cost is practically irrelevant. A boost of the Smithing skill can be achieved the same way: after crafting the Fortify Enchanting potion, put a Smithing enchantment on a piece of gear. Improving a piece of armor or weapon will also boost Smithing from 15 to 100 if you have 4-5 pieces of the tempering material. Giving one such improved weapon to someone and then goading them into attacking you will level any armor skills to 100 (provided of course that you are wearing some light or heavy armor in the first place). It will also almost certainly kill you, unless you are wearing armor that has been given a high powered Fortify Health enchantment. This trick can also level the block skill to 100 instantly, by blocking when they attack you. Selling the obscenely expensive items produced by this process can be used to level Speech. If you complete enough of the College of Winterhold quests you gain increased magicka regeneration while standing in the campus. Equipping Invisibility on both hands with no perks in Illusion you will find that you can indefinitely cast the spells over and over and can level up the skill forever. As you can make the skill legendary as many times as you want, each time you hit level 100 simply make it legendary and start over again. Through this you can level up fairly quickly without any risk, bounties, or costs. For tips on how to train skills effectively, please refer to the respective section of the individual Skill page. See the Free Skill Boosts page for details on free boosts to certain skills. This page was last modified on 17 February 2019, at 20:16.